“Tra Parole e Silenzio” is a hauntingly beautiful journey into the heart of Italian civil rights activist and lawyer Eduardo Di Giovanni (1931 – 1990) celebrating life’s most precious and enduring treasures - love, home, family and friends as interpreted by Mara! band composers and performers together with Sydney’s magnificent Martenitsa choir. Powerful yet vulnerable, this exquisite song-cycle features music composed by Australia’s leading World music ensemble Mara!, whose insightful interpretations of poetry written by Eduardo in his early years, perfectly illustrate this young man’s musings on love and human potential, within the vividly emotive and tactile landscape of Italy in the 1950s and 60s. This captivating work was the centrepiece of the 2015 Summer European tour by multi award winning Mara! ensemble with Martenitsa Choir featuring Bulgarian soloist Silvia Entcheva (formerly of Le Mystère des Voix Bulgares). The work is a 70 minute song-cycle and featured the tour party of Sandy Evans on saxophones, Paul Cutlan on saxophones and clarinet, Llew KIek on bouzouki & guitar, Brendan Clarke on double bass and Mara Kiek on voice and percussion with Martenitsa choir and soloist Silvia Entcheva. In a genuine union between contemporary Italian and Australian cultures, Mara! & Martenitsa choir performed ‘Tra Parole e Silenzio’ with local Italian choirs participating in Soriano and Viterbo. Without the invaluable assistance of Peta Lowry, Australia Consulenza in Soriano nel Cimino, this tour would not be possible. We also wish to gratefully acknowledge the assistance and advice of the Australian Embassy in Rome. The CD of Tra Parole e Silenzio is distributed in Italy by Materiali Sonori. Partii Ch'era il Giorno di Natale: Mara! 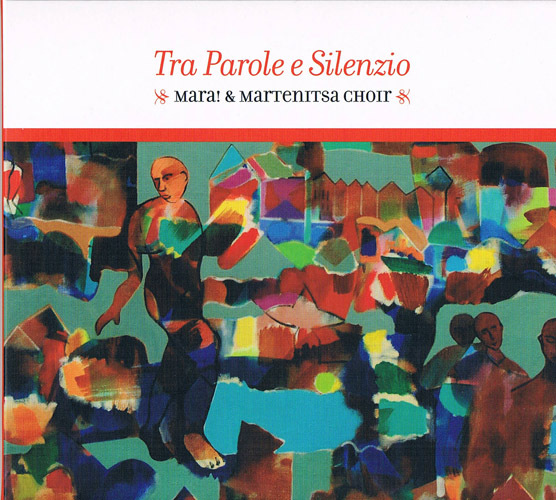 and Martenitsa Choir - Watch video with audio from the Tra Parole e Silenzio CD. 10 years in the making, Tra Parole e Silenzio was born of the longstanding friendship and working relationship of Mara! ensemble and Daniele Di Giovanni (son of the poet). Since the Australian premiere in 2004 at Fox Studios, Sydney, this song cycle has been presented at the National Folk Festival Canberra, Paddington Uniting Church and Fairlight Acoustic Lounge. Recording was completed in 2011 and the CD was launched at Sydney's Red Rattler, the Wollongong Performing Arts Centre, Live at the Village in the Blue Mountains and then the Woodford Folk Festival 2011. Tra Parole e Silenzio was presented at the Italian Forum in 2012, on stage 1 at WOMADelaide in 2013, and at DiLusso Wines in the Hunter Valley in 2014. Our recent gala concert in June 2015 at Paddington Uniting Church saw us return with TPES to one of our favourite Sydney venues. We vowed to take Tra Parole e Silenzio to Italy, to perform it for (and with) our friends new and old. Unfortunately the GFC caused many regional festivals to reduce their programmes due to lack of funding. Some ceased operations entirely. We were advised to postpone the tour until the economic climate in Italy improved. In spite of the economic conditions only improving marginally, we decided 2015 was our year!